Thailand´s capital Bangkok is obviously one of the greatest food paradises in the world. But what if you are a vegetarian? Vegan food is hard to come by in Bangkok. 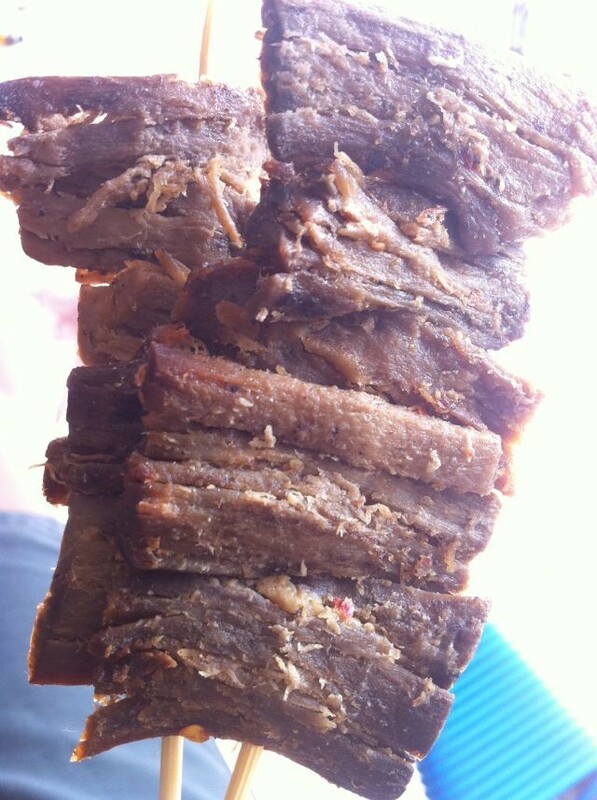 For the most part, vegetarians have to find a way to feed themselves in this city, with streets upon streets lined with food stalls selling almost nothing but “MEAT”. Don’t worry you can find lots of amazing vegans food here should you know where to look. Here are some of the best place in Bangkok which can help us fellow vegetarians enjoy our trip to the fullest. 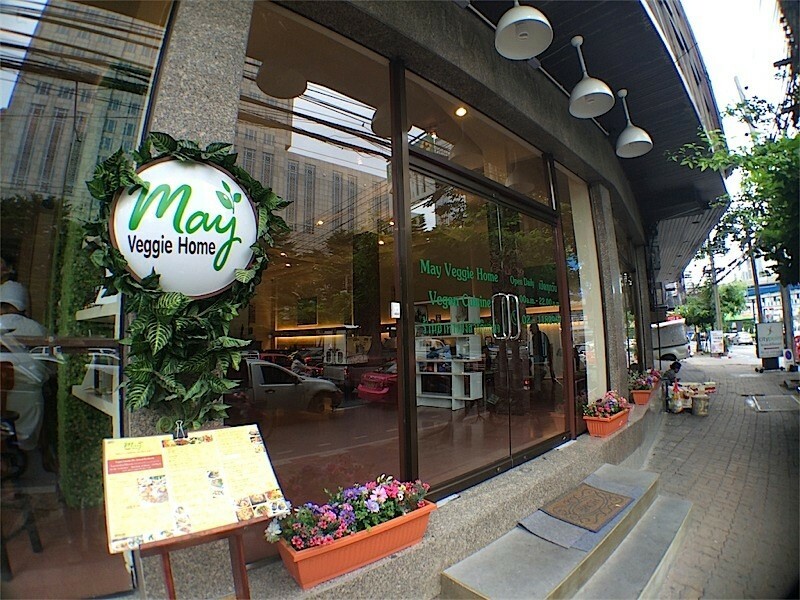 May Veggie Home is an all vegan restaurant in Bangkok that serves a mix of Thai, Japanese and Western dishes including vegan cakes and ice creams. The restaurant itself is really nicely designed; it’s the kind of place we’d be happy to take anyone to (vegan or not) as they’ve clearly taken the time and effort to make it look good and there’s plenty of choice for all tastes. My favorite dish here is the stuffed avocado salad. 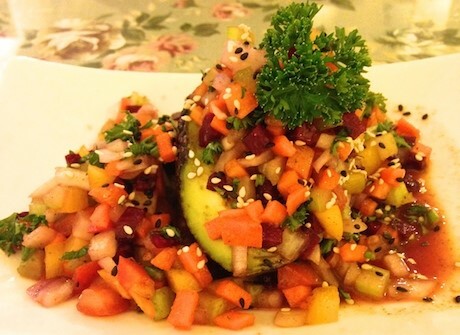 This is basically a wonderfully ripe avocado covered in a crunchy chopped salad of carrot, beetroot, onion, and celery tossed in the most delicious sweet vinaigrette dressing. Some other must try dishes are Penang Curry with tofu, pad thai, and vegan spring rolls. 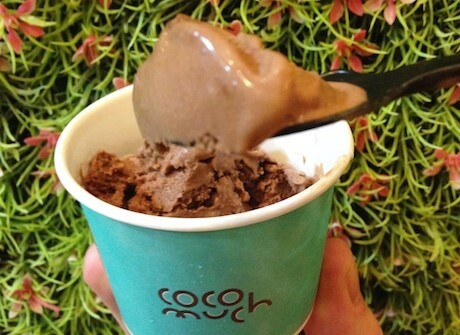 And for dessert, I recommend you end the meal with a coconut-based ice cream from Coco Much rather than one of the vegan cakes (I found them kind of dry). Directions: Take the BTS to Asoke station, leave via exit 4 and walk down Sukhumvit Road until you get to Ratchadaphisek Road (this is the main Asok/Sukhumvit junction), turn right, walk 100m and May Veggie Home is on your right. 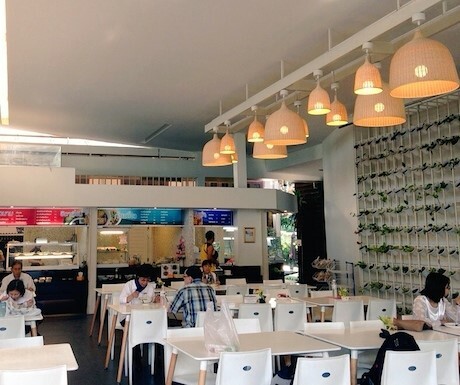 This local, all vegan food court serves a great variety of Thai food either ready made or served to your table in minutes; there’s even food to take away. There are soups, mock meats, noodle dishes, tofu, veggies and every Thai flavor you could ever dream of. Since Baan Suan Pi is pure veg, you can try what you want without worrying about any sort of meat products being in the food. That includes ingredients like fish and oyster sauce, which is difficult to avoid on the street or in typical restaurants. Your favorite Thai dishes have all been re-done with fake meat, mushrooms and tofu substitutes. Most dishes here are quite cheap, a plate full of tofu, vegetables and mock meats with rice will only cost you from 30 to 50 THB (1 to 1,5USD).There were also some delicious fresh spring rolls and a great juice bar where you can select your chosen fruits and veggies and they’ll juice them right in front of you for 40 THB. 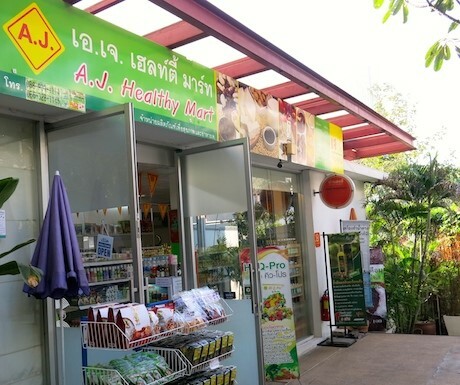 A visit to Baan Suan Pai can also be combined with stocking up on goodies from the small health food shop on your left as you walk in. It’s a great place to buy nutritional supplements, vegan snacks, and natural cosmetics. Remember they’re open from 7am-3pm, so don’t wait too late in the day to stop by. Directions: Take the BTS to Ari, leave via exit 1 then walk towards the Esso garage. The entrance to Baan Suan Pai is just before the garage, on the right; walk all the way down to the end of the covered walkway (there’s stalls either side), turning left at the end and the food court opens up in front of you. 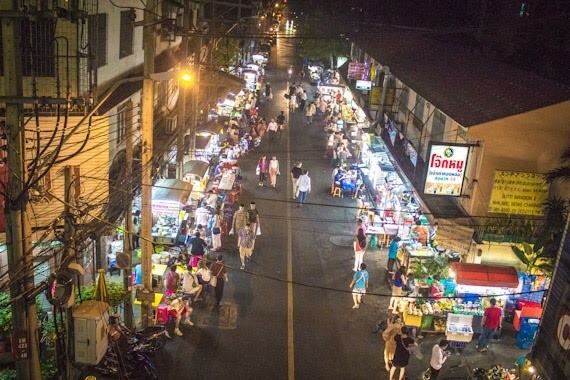 Head to Sukhumvit 38 to eat on the street with the locals; it’s lively, the smell of chilies and garlic fills the air, the noise of stir frying in giant woks and you’ll be surrounded people and the hustle and bustle of Thai life. You will need to be careful here to keep your food 100% vegan. 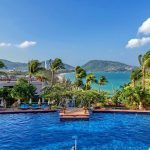 There are a few simple Thai phrases you’ll need to help convey your preference. The words “kin chey” and “mangsavarat” both imply vegetarianism. In a sentence, you may say “Di chan kin chey” (for females, or “Pom kin chey” if you are male). It also helps to learn the words for meat so you can discover what is in a dish. Learning that moo is pork, gai is chicken, neua is beef, pla is fish and kung and prawns will allow you to ask “mi moo mai?” or “mi gai mai” (Does this have pork, does this have chicken?) It will also allow you to say “mai kin neua” or “mai kin pla“. (I don’t eat beef, I don’t eat fish). The pad thai here is really good, and it tastes even better in the lively atmosphere of the night market. 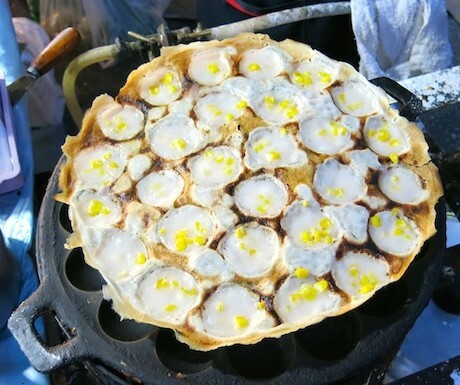 Another must try at the night market is ‘khanom krok’ – my favorite sweet vegan street food made from rice flour, sugar and coconut milk. Directions: Take the BTS to Thong Lor, head to Soi 38 and at the top of the street as you turn in, on the right-hand side as you enter, there’s a sub soi where you’ll find the ‘Award Winning Pad Thai’ stall at the end. 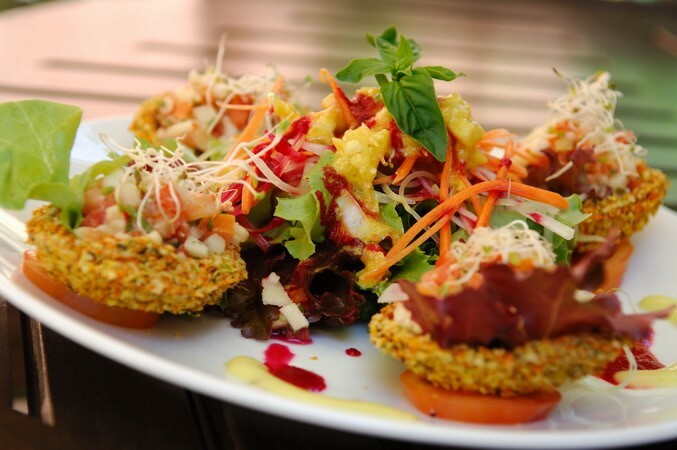 This raw food restaurant does amazing things with fruits, nuts, seeds, and vegetables. They have great juices, soups, salads, mains, and desserts – all at very reasonable prices.My favorites are the Hawaiian Pizza, the Thai Pasta, the Thai Lemongrass (Tom Kha) Soup and the Strawberry cake. The Thai pasta noodles are made from strips of coconut flesh and zucchini; the sauce is made fresh using tomato, beetroot, chili, garlic, ginger, raisins, macadamia nuts and kaffir lime leaf. The Tom Kha soup is a blended raw soup made with coconut water, coconut flesh, lemongrass, galangal, lime, kaffir lime leaves, avocado, miso and salt to taste. 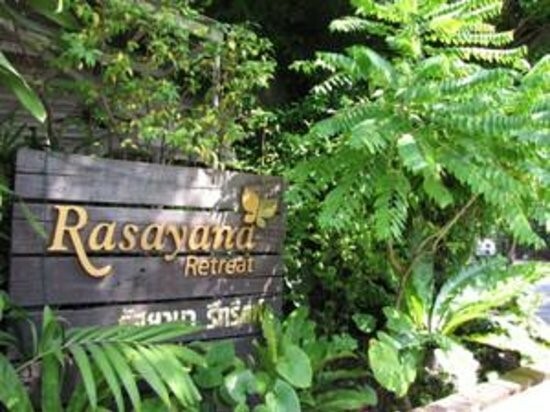 Another great thing of Rasayana Retreat is they do great takeaways. 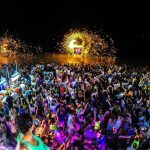 You can pay them a visit in your last night in Bangkok and order some delicious takeaways for your long flights, the package is really neat and you won’t have any problem taking them on the plane.